In Brazil, commutes make up about half of all daily trips. Because the majority of the commutes occur at peak hours, Brazil’s major cities are facing intense congestion, particularly during rush hours. For example, in the metropolitan areas of São Paulo and Rio de Janeiro, congestion costed the cities a total of R$ 98 billion (~25 billion USD) in 2013. Moreover, traffic jams and overloaded roads in the greater São Paulo region costed Brazil R$ 156.2 billion (~40 billion USD) of its GDP. In order to optimize existing transport infrastructure and drive down congestion, cities have begun searching for new models and solutions. One answer is travel demand management (TDM) measures that focus on businesses as agents of change—a concept known as corporate mobility. Corporate mobility aims to minimize commutes with private cars among employees by introducing corporate policies that encourage shared, public and non-motorized modes; for example, a business could offer special parking spaces for employees who carpool. In short, these measures can be used by public and private employers as a tool to promote more sustainable travel habits among employees. To identify successful methods of implementing TDM measures, WRI Brasil Sustainable Cities published “Step by Step to Building a Corporate Mobility Plan,” a practical manual which launched this September in São Paulo. In São Paulo, 80 percent of people say that they would leave their car at home if they had better alternatives of transportation. That’s where corporate mobility measures come in: to expand these options. With strong incentives for sustainable transport modes, people are far more likely to change their travel habits. 1. Prepare: for developing the plan by identifying the needs of the organization, win the support of the board, map stakeholders, establish the plan’s steering committee and appoint a coordinator. 2. Define the Scope: of the plan by forging its vision, objectives and limits according to the company’s context and needs. 3. Communicate: the plan’s vision, which is essential for engaging employees and encouraging a change in culture. 4. Diagnose: the current transport conditions, the policies and costs, and the travel pattern of current employees. 5. Elaborate: on the available budget and the strategies that will be used; this is the launch moment of the plan. 6. Implement and Promote: the strategies of the plan, and spread and reward good results. 7. Monitor and Review: all progress accomplished by the plan, tracking success benchmarks. Historically, many companies in Brazil have not felt responsible for the ways in which their employees get to work. However, as congestion is increasingly affecting commute times, companies have a larger vested interest in their workers’ mobility patterns. Indeed, long and stressful trips damage employees’ quality of life and have a negative impact on their productivity during working hours. Now more than ever, companies should begin to take action to encourage the use of more sustainable, healthier modes of transport. Consider São Paulo, where in 2012 WRI Brasil Sustainable Cities—in partnership with the World Bank—worked with 20 companies to improve mobility. Before the project, more than half of the 1000 employees of one business used to drive alone to work, and less than 20 percent used public transit. However, at the end of the initiative, the number of people driving alone to work dropped 17 percent, while the number of employees using public transit increased 10 percent. 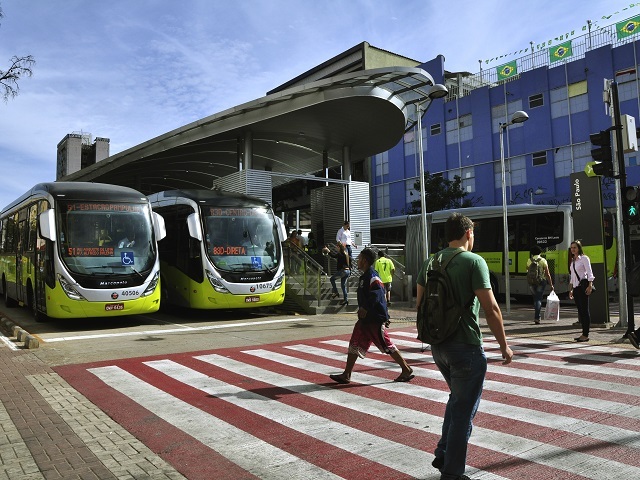 Further, in Belo Horizonte, the government of the State of Minas Gerais has taken the lead on improving urban mobility. The administration, with assistance from WRI Brasil Sustainable Cities, is developing a corporate mobility plan to improve the commute of 17,000 employees that each travel around 20 km for work. The population in big Brazilian cities is growing—but so is the urban congestion. The productivity lost from traffic costs the country 2.83 percent of its GDP. Corporate mobility plans are a crucial tool that companies can use to reverse this scenario, boosting worker productivity and reducing emissions. Businesses should promote sustainable transport options in order to change shift Brazil’s cities away from the car-oriented commute pattern that is harmful to everyone – people, companies and cities—to a healthier, more sustainable one. Otherwise, that morning commute will only get worse.